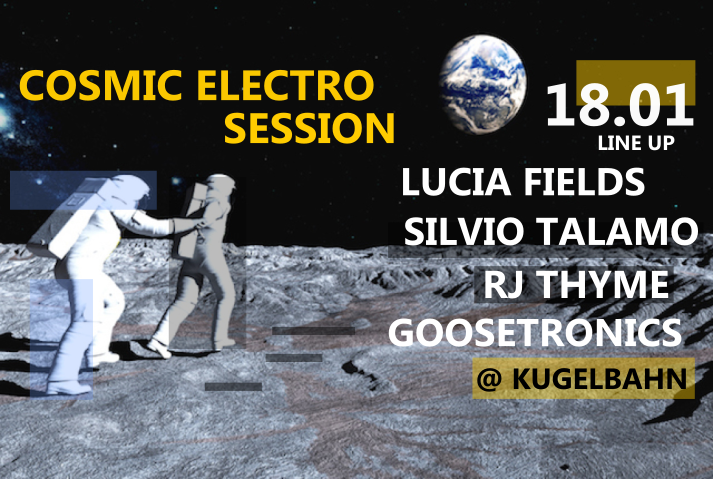 The Cosmic Electro Session is a session dedicated to electronic music and\or the mix between the electronic music and acoustic, or not electronic, music: * half Synthetic, half Organic*. It is open to every kind of musicians, singers, djs, loopers, finger-drummers, beat-boxers, laptop and synth lovers. There is not a prevalence of genres just the energy of the proposal! Lucia Fields met in spring 2016. Using machines, samplers, synthesizers, effects, vocals and violins they provide a musical range from trip hop over slow tech to tech house – Eurodance 2020! After two years of playing and jamming all the time – day and night in public spaces – they went deeper and deeper into a production process, which will soon bring about a new side of Lucia Fields. Their current live shows mix the old wild clubby performance with songs, and this is still just the beginning of Eurodance 2020! RJ Thyme is a Berlin Based artist. He works primarily in the music field as a producer and DJ. In both roles, he tends towards a more exploratory, experimental, and storytelling approach. Having started making music at the age of 14, RJ found interest in many different fields having spent many years studying film and theater. As a music producer, he takes the listener on a journey. Canadian born dj and producer whose beginnings go all the way back to 2002 in the small town of Antigonish, Nova Scotia where in the basement of remix reaper he started learning the craft of DJing. As a teenagr he moved to the party city of Banff in Alberta and was taken in by systematic earthly gadgets and first taught how to produce by Bkode, to later on form the disorderlys and release an album and two singles as well as become a part of lowself productions & shuga shack productions, a resident at Hoodoo, a regular at dancing sasquatch, aurora and the hippy house banff. Had the pleasure of playing various sets at canadian festivals such as syncfest and edfest. Finished off his stay in Canada with an across the country tour, done directly before moving to Berlin to learn more about the scene and explore. Having focused on production for the last 4 years, he is currently taking steps to get back into the DJing game.